White paper on crime 2004 Part5/Chapter3/Section2/4. Stimulant drugs used to be marketed under the trade name"Philopon"etc.under control of the Drugs,Cosmetics and Medical Instruments Law.However,its abuse prevailed widely,resulting in the enactment of the Stimulant Drug Control Law in1951.The following is an overview of the trend in number of stimulant drug prisoners since1953,when the data are available. Fig. 5-3-2-33 shows the number of newly admitted prisoners convicted for Stimulant Drug Control Law violations.The number had remained below200for a long term after reaching the first peak in1955,which indicates that the crackdown under the newly implemented Control Law successfully terminated stimulant drug abuse smoothly.However,it started to increase rapidly again from around1971,exceeded5,000since1979,and stood at6,774in2003.The peak in1984was referred to as the second peak of stimulant drug abuse,and the peak in1997has been referred to as the third peak. Fig. 5-3-2-34 shows the number and percentage of stimulant drug prisoners at the end of each year since1954.The stimulant drug prisoners'percentage had remained less than1%from1957to1972,but increased significantly after that.At the end of2003,15,098(24.8%)out of60,851prisoners were stimulant drug offenders. Fig. 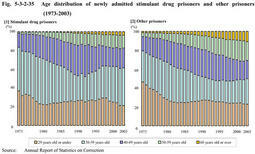 5-3-2-35 shows the age distribution of newly admitted prisoners since1973,comparing stimulant drug prisoners with other prisoners.As mentioned in2in this section,aging has advanced among prisoners,however stimulant drug prisoners show different characteristics that those aged60or over are relatively small in percentage,while the percentage of those in their thirties has been on an upward trend in recent years. Fig. 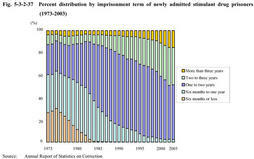 5-3-2-36 shows the frequency of imprisonment of newly admitted prisoners since1973,comparing stimulant drug prisoners with other prisoners.The percentage of those admitted for the first time in stimulant drug prisoners has been leveling off,in contrast with its upward trend in other prisoners in recent years(see also Fig. 5-3-2-7 ).This is due to the constant emergence of a certain number of new drug users as well as the unending recommitment of existing drug abusers. Fig. 5-3-2-37 shows the percent distribution by imprisonment term of newly admitted stimulant drug prisoners since1973.As mentioned in Section1in this chapter,the imprisonment term has become longer for stimulant drug abusers(see Fig. 5-3-1-14 ),and the same tendency can be observed for overall stimulant drug prisoners. Stimulant drug prisoners are divided into end users and those engaged in drug trafficking.It is important to know how many of them are users,since different imprisonment terms are applied to users and traffickers,and different points are stressed in their treatment for rehabilitation. No direct data are available for this point.However, Fig. 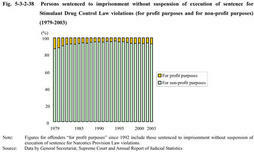 5-3-2-38 shows the percentages of offenders"for profit purposes"and offenders"for non-profit purposes"in persons sentenced to imprisonment(without suspension)for Stimulant Drug Control Law violations(Since1992,heinous drug trafficking has been punished more severely for Narcotics Provision Law violations,instead of for Stimulant Drug Control Law violations.Therefore,figures"for profit purposes"since1992include those for Narcotics Provision Law violations.). As the figure shows,around93%of those sentenced to imprisonment did not have profit purposes,stabilizing since1998,and most of them were considered to have been users. Stimulant drug prisoners are at high risk of repeating offenses due to drug addiction.The following examines this point through statistical data. 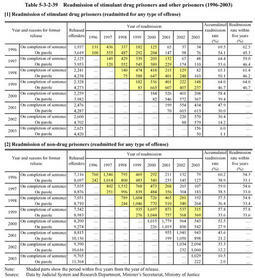 Table 5-3-2-39 shows the numbers of released stimulant drug prisoners readmitted to prisons after their release since1996.In the same way, Table 5-3-2-39 shows those numbers of other prisoners.For stimulant drug prisoners,the percentage of those readmitted within the following five years after release was59.0-64.0%for those released on completion of their sentence,and45.3-46.7%for those released on parole.These percentages are higher than those of other prisoners(generally,about54%for those released on completion of their sentence,and about33%for parolees). Table 5-3-2-40 shows the numbers of released stimulant drug prisoners and readmitted ones after release for Stimulant Drug Control Law violations since1996.For the prisoners released on parole,the percentage of those readmitted for Stimulant Drug Control Law violations within five years after release was over35%every year,more than a33%of the five years readmission(for all offenses)percentage of other prisoners released on parole(see Fig. 5-3-2-39 ).This indicates that a stimulant drug prisoner has a high risk of repeating same offense. Fig. 5-3-2-41 shows how many of stimulant drug prisoners were readmitted for Stimulant Drug Control Law violations within how many years after their release in1996-1999.Readmissions for Stimulant Drug offenses within two or three years after their release are large in number,which indicates that the high risk period of their repeating offenses is the first three years after release. Since 1979,when the number of stimulant drug prisoners showed a sharp increase and exceeded5,000,some prisons started to provide special treatment programs for those prisoners,which gradually spread nationwide.Furthermore,since April1993,education programs for preventing stimulant drug abuse have been provided as a part of guidance programs for treatment type.Guidance programs for treatment type give guidance for improving adaptation to society to small groups of prisoners,who are divided according to their offenses,their individual disposition that had caused offenses,and factors that would hinder their rehabilitation into society(for further details,see Section3-4of this chapter). According to Data by Correction Bureau,Ministry of Justice,68out of74main prisons provided such programs for stimulant drug prisoners in2003,with the participation of a total of3,562inmates(including those in branch prisons).Their contents and schedules vary in each institution,but most programs consist of six or12guidance sessions,each session lasting for one hour,conducted once a week or once a month.Each program is generally for five to15inmates,and59prisons out of the68above provided multiple groups with programs in multiple cycles of twice to four times a year,with a maximum of13times a year.Eight prisons had multiple kinds of programs for different inmates,such as for first-time offenders and for repeat offenders etc. Basically,prison staff take charge of those guidance programs.However,45prisons out of the68above invited visiting lecturers,such as psychiatrists,probation officers,pharmacist,police officials,prefectural governments'officials in charge of pharmaceutical affairs,and members of private bodies working on the prevention of drug abuse,who give lectures on the harmful effects of drugs,offer group counseling,and describe their own experiences of drug deprivation etc. 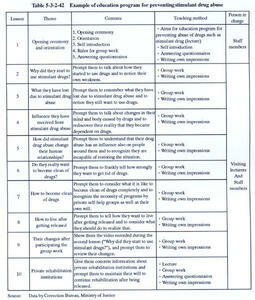 Table 5-3-2-42 shows an education program for preventing stimulant drug abuse at a certain prison that accommodates Class B prisoners with an advanced criminal tendency.Each lesson with a specific theme is composed mainly of group work and writing participants'own impressions.In group work,participants are encouraged to present their own experiences and opinions,and are expected to deepen their consciousness and awareness through mutually pointing out one another's problems.Participants'statements in the second lesson are videotaped,and are shown in the ninth lesson to prompt them to review their changes.The program is designed not to just end up being knowledge transmission or passive education. Once a person becomes addicted to stimulant drugs,it is not easy to be free from the addiction.To stop using stimulant drugs,it is necessary for them not only to understand why stimulant drugs are dangerous,but also to recognize their own addiction and have a strong will to"be free from it. "However,many drug abusers think that they can stop using drugs at any time and are not aware that they are addicted and cannot become free so easily.Therefore,the first step for them is abandoning such ideas and recognizing that becoming free from drugs is a hard task that requires real efforts by them. At present,most prisons provide education programs for preventing stimulant drug abuse,and more and more prisons adopt group work to prompt participants to notice their own addiction.In group work,participants are divided into small groups of around10members,and are encouraged to talk together about their own experiences,how they felt and what the situation was when they used drugs,and what they gained and what they lost through drug abuse.Through the discussions,they are guided to become aware of their own addiction,to realize that through drug abuse they have lost lots of things,and finally understand what they should do. It is difficult to present the effects of the education programs in a visible way.Prisons can not check the successful effects from those who became free from drugs,because they do not return to prisons.Unfortunately,some do not show remarkable effects just through receiving the education program once.However,it is very important to provide as many stimulant drug prisoners as possible with a chance of fighting their own addiction,and the efforts for that purpose must have produced some steady effects.Each prison continues further efforts to improve the contents of the education programs to end addiction,seeking cooperation with related organizations including private support groups for drug withdrawal.